We appreciate your support for DARTSLIVE in 2017! We hope you have had wonderful experiences in this year with DARTSLIVE such as thrilling matches and fun parties at DARTSLIVE shops. We are grateful if we have provided you with amazing darts experiences. There are only several days to go to New Year's Eve. Here is the last fun game from us to you in this year. “NEW YEAR COUNT-UP 2018” is a COUNT-UP game with fireworks in various locations of the world. *Regular “COUNT‐UP” is also available. 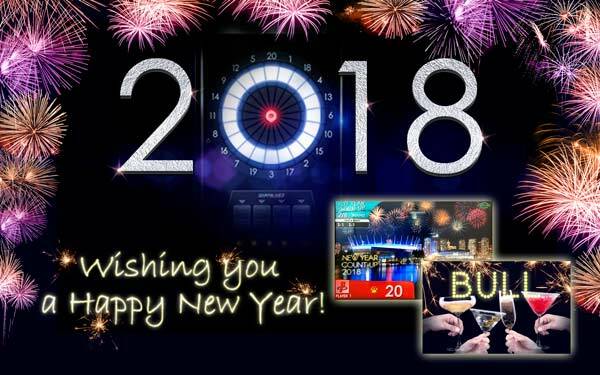 *DARTSLIVE THEME does NOT appear in “NEW YEAR COUNT-UP 2018”. This is the perfect game to make your holiday more fun and exciting! Enjoy darts in this holiday season as well. We will bring you more excitement to your darts life in 2018. Wishing you amazing darts experiences in the coming year as well!